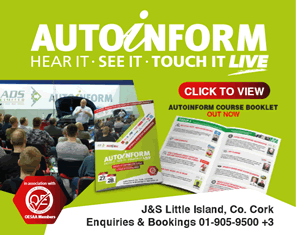 Established in 1977, J&S Automotive is one of Ireland's premier vehicle component distributors. The success of the company has been based on the supply of components of the highest quality, and the provision of first-class up-to-the-minute product information on various platforms, including TecDoc and MAM Autonet. J&S Automotive is a family-owned business employs a staff of sixty at its highly efficient distribution and delivery centre in Dublin, which stocks over 100,000 individual parts. Customers also benefit from a flexible service, with fast order turnaround and excellent availability. Throughout its development, J&S Automotive has successfully followed a programme of continuous improvement, something that is reflected in ongoing staff training across various aspects of its business. The emphasis of this training and development is on maintaining a strong customer focus, meeting goals and providing a level of service and innovation that can genuinely help a customer's business grow.